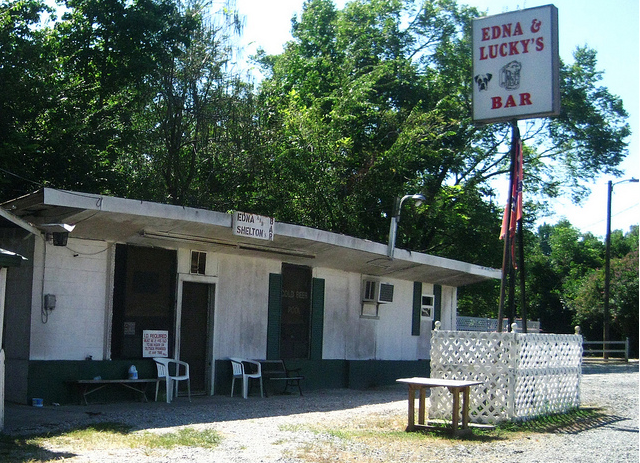 This simple cinder block building housed a bar called Edna and Lucky's. The building used to extend further, but was lost in a fire. Edna and Lucky's was demolished in 2009 or 2010 to make way for the expansion around the new Wal-Mart. Karen - love this. I built Open Durham in the hopes that (lots of) people would share stories of places and memories like this. Thank you! None of my memories of Durham are more than 8 years old-hopfully when I've survived a few more decades in Durham I'll have more to add! I just thought that the bar deserved more of a legacy than defunct citysearch listings with no reviews even. If everyone started to leave more comments and descriptions about current buildings and businesses, 50 years in the future someone else will love having that perspective and information. Just because something isn't historic yet doesn't mean that it won't be. I am pretty sure the internet is not going anywhere, so we have the opportunity to document life in Durham today for future generations. Plus, I LOVE an ugly building, and boy was Edna's ugly. The bar has been closed for a while but the building is still standing full of memories of Zandy, the ' H. A. ' guys and other ol' Dale fans on a Sunday afternoon with a Bud. The building itself was nothing fancy. But the bar was a gem. Shortly after I moved to Durham in 2004, my friend Rocky and I were looking for somewhere new to meet for drinks. I think at the time maybe I fluctuated between Jo and Joes and Ringside with a little Federal mixed in? We went through the phonebook and eliminated any sports bar, any place we'd been, and anything too stuffy. Of the few left, how could we not choose one named Edna and Lucky's? The building sat directly off of the highway exit, and was at that time surrounded by nothingness. If the light in the parking lot was out, it was pitch black. Inside, it was part house, part 70s red vinyl and wood paneling kitsch. The bar only sat about 6-8 people, with a few tables crammed in other locations. There was a pool table that took up a comically large amount of space in the bar considering the floor was slanting so badly. The jukebox was pure gold - it rivaled Green Room's. You had 4 choices of bottled beer for $2 and nothing else on the menu. Edna was in her 60s and treated us like her kids. There was a full size residential stove and fridge behind the bar, and she would always want to make you a liver pudding sandwich or pop you microwave popcorn. Edna was tough as nails (a former biker) but had the biggest heart. There were always numerous dogs (including Lucky before he passed away) running around the bar, as well as stray cats. The bathroom was outside of the building, and one night I remember turning the corner in the pitch black out in the country and coming upon a racoon eating cat food left for the strays. There was always a Lifetime movie playing on the TV, and the ding ding of the gamling machines. The smoke was so thick in the bar that you'd have to go stand outside periodically. There was always a second sign outside that said Edna and Shelton's, who I always assumed to be an ex-husband, replacing his name in the business with that of her dog? Would be curious if anyone remembers it from those days (or earlier even)? It's safe to assume that this may've been a gas station back in the day from the design. Most of the buildings on Glenn School Rd were built between 1930-1950, so I would put this in that same time frame although I have nothing to back that up with. When I first went to Edna and Lucky's, the right side of the building extended farther. There had been a bad fire there years earlier, and they seemed to just operate around it. This sooty black shell of the building still remained. You could smell it when you parked. They removed that part sometime in the late 2000's I assume. Also, behing the building closer yet to the highway were numerous other outbuildings, an old house and various old semis and cars, which can be seen in the satellite images on the map. I had stopped going there for many years but made a quick stop in before they were demolished and was glad I did so.